IN advance of Eat Scottish Venison Day 2014, Ballathie Country House Hotel was chosen as the major venue for key industry figures to brief the media and present Scottish Venison feast. During a celebratory venison lunch at Ballathie Country House Hotel in Perthshire yesterday (28 August) media guests were given the opportunity to hear about highland and lowland deer management. Gordon Clone, Ballathie’s own gamekeeper who looks after stalking on the Ballathie Estate also spoke about the importance of deer management to encourage healthy herds. Guests were informed about the growing popularity of Scottish venison leading to the increasing demand for more deer farms. Venison industry news was also on the agenda and guests were able to experience for themselves the culinary and tasty benefits of venison, thanks to special dishes created by head chef, Scott Scorer. “We are delighted to have been involved with Eat Scottish Venison Day and to have hosted this lunch as part of the celebrations,” says hotel manager, Jody Marshall. “These are exciting times for Scottish Venison with retail sales having quadrupled over the past year. Stalking on the Ballathie Estate is popular with our guests and venison is naturally a favourite on our menu. Eat Scottish Venison Day is celebrated across the UK each year on 4 September. To help publicise and honour the event this year, Ballathie House Hotel was chosen as the venue to brief the media. 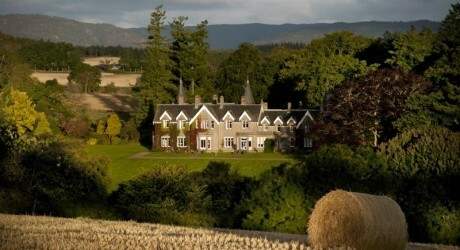 The highly-acclaimed Independent Hotel of the Year 2014 sources much of the venison used on the menu from its own Ballathie Estate where many guests enjoy stalking themselves. Venison on the menu has always been extremely popular, largely due to chef, Scott Scorer’s interesting creations. Ballathie is naturally featuring venison on the menu and is giving this superb Scottish produce a strong focus for the next fortnight to help celebrate Eat Scottish Venison Day. Ballathie Country House Hotel is located on the banks of The River Tay, north of Perth just outside the village of Kinclaven within easy reach of Scotland’s major cities. In the UK last year (12 months to end June 2014), retail sales of venison from supermarkets increased by over 400 per cent (source Kantar Worldpanel). This does not take into account direct sales by butchers, the hotel and catering trade, further processed products, farmers markets and mail order sales. UK suppliers are importing venison from New Zealand, Poland and Spain to satisfy the demand. The need for more deer farms in the UK is increasing and Scottish Venison Partnership, endorsed by the Scottish Government, is working towards the objective of producing an additional 1,000 tonnes of on-farm venison per annum by 2020. In the past two years work has started on six new deer farm units, with a total anticipated capacity of 2,500 hinds. These six alone could effectively more than double the current Scottish farmed venison output of 50 tonnes per annum. Eat Scottish Venison Day is on 4th September and many restaurants, butchers and retailers are putting on special offers and dishes to mark the occasion. MEDIA RELEASE issued by Thompson PR. You too can post your story ideas for journalists (aka press or media releases), on allmediascotland.com. Email info@allmediascotland.com for more information. Check out twitter.com/nonstopstories. Check out too twitter.com/allFoodPR.